Organizations and community rally together to surprise Southwest Florida family with a mortgage free home. BABCOCK RANCH, Fla. — Life is not a race, but indeed a journey is the motto the Appleby family lives by. 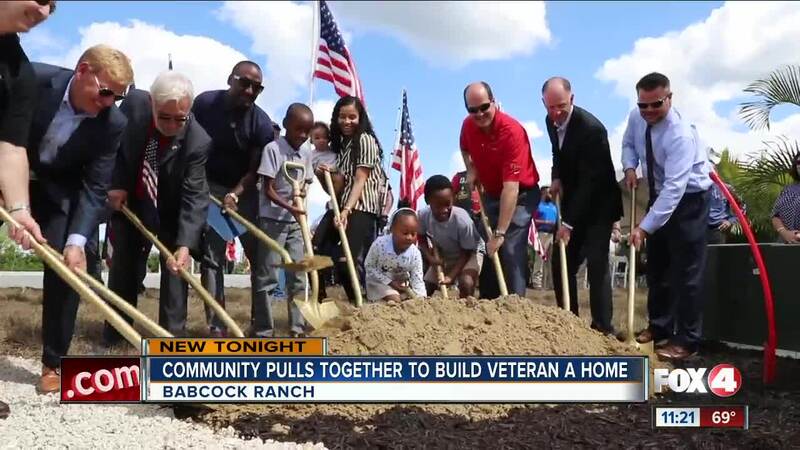 Friday they started a new journey by receiving a mortgage-free home in Babcock Ranch as part of PulteGroup’s Built to Honor program in partnership with Operation FINALLY HOME. Operation FINALLY HOME is a non-profit that provides homes for military heroes across the country. Built to honor provides mortgage free homes to veteran’s and their families. It was a complete surprise to U.S. Army Sergeant Howard Appleby, his wife Yoland, and their four kids. u.s. army sergeant howard appleby “i was in shock, i was in shock when i saw my name, ya it’s a surprise,” said U.S. Army Sergeant Howard Appleby. “We were completely caught off guard and you know it’s amazing it was a long journey but it was worth it, completely worth it,” said Yoland Appleby, wife. More than 200 people came out to support the family, including other war veterans. “Doing this today for this gentleman and his family it touches my heart as a veteran,” said Butch Rode, Vietnam Veteran. “It shows a lot of support for vets, because as you know we didn’t have a very welcome home, but it’s working out today, they are making up for it,” said Henry Moreau, Vietnam Veteran. Sergeant Appleby served for seven years retiring in 2011 for medical reasons. During his service he was deployed to the Middle East and encountered multiple improvised explosive devices (IEDs) resulting in PTSD and cognitive impairment from traumatic brain injuries. Appleby says this new home with help him focus on his health by giving his family stability. “Less strain on the family finances because we won’t have a mortgage to pay so that’s a big burden off our shoulders,” said Yoland Appleby. The foundation for the home has been laid, and the family of six is set to move into their new neighborhood this summer. “And just make one families dream come true so it’s a blessing, it’s truly surprising, amazing,” said Appleby.